You don’t need more than three children to justify buying a seven-seat car. With flexible interiors that let you fold, or even move the seats, these are some of the most versatile vehicles on the road, offering the option of cavernous boot space, luxurious space for a few passengers or, indeed, room for half a football team in the back. That’s true of the latest Hyundai Santa Fe, which is said to have more room in the middle row of seats than any other car in its class, as well as a large 625-litre boot (the rival Nissan X-Trail only has 565 litres) if you go for the five-seat model. Seven seats are expected to be optional and to reduce boot capacity. A tall and rugged-looking Sport Utility Vehicle (SUV), the Santa Fe is due to arrive in Britain in September, replacing the current model, which is likely to be discounted in the coming months. The new car looks to be a strong alternative to other spacious SUVs, such as the Skoda Kodiaq, Kia Sorento, Nissan X-Trail and Peugeot 5008, which also offer seven seats, as well as the Ford Edge and Renault Koleos, which don’t. The front of the cabin is equally spacious, with plenty of adjustment in the driver’s seat to find a comfortable position. The layout is straightforward, with a touchscreen in the middle of the dashboard, along with physical buttons, which are easier to use when driving. There’s another screen between the dials, for extra driving information (such as sat-nav directions), as well as an optional head-up display, which keeps your eyes focused on the road for longer. The Santa Fe has been designed for comfort and stability rather than nimble cornering and excitement - much like its rivals. The steering is accurate, so you quickly learn how much you need to turn it for any corner, and it grips well, going where it’s pointed. There’s not too much leaning in corners either. With four-wheel drive as an option, the Santa Fe is less likely to get stuck on muddy ground or in snow, but it, and most of its rivals, aren’t really designed to go off road where their low bumpers can catch on rough ground. This means that you do pay a premium for the car’s design. Seven-seat people carriers, such as the VW Touran, Ford Grand C-Max, Citroen Grand C4 Picasso and Vauxhall Zafira Tourer are all available for less than £25,000 new (and considerably less used) but do look more like minibuses. 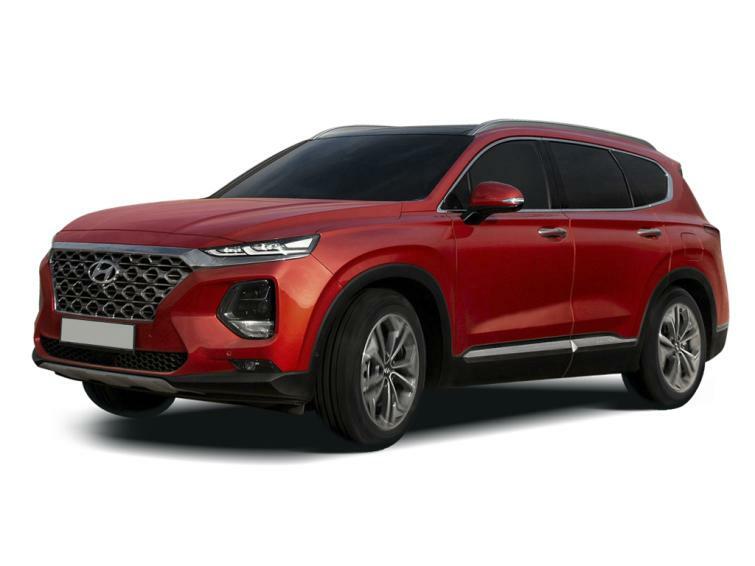 The Santa Fe will start at £33,425 when the car goes on sale, with more popular higher-specification versions costing upwards of £40,000, while top-of-the-range Premium SE spec cars will set you back £41,495, even without four-wheel-drive. The cheapest 4WD model is a Premium with a manual gearbox (£38,995). The most expensive model will be a Premium SE, with an automatic gearbox and 4WD. This will set you back a whopping £43,595. For that money, you could also have a slightly less spacious Land Rover Discovery Sport. The Santa Fe is expected to hold its value well, which means that monthly finance costs for new cars should be available for less than £300, depending on your deposit. Hyundai has made it easy for buyers to choose an engine: there is only one diesel, which was also fitted to the previous generation. It’s a strong engine that’s good for towing and which provides steady acceleration, enabling you to easily keep pace with traffic. Official MPG figures haven't been released yet, but the manual 2WD version of the old car was significantly less-thirsty than 4WD automatics. Most families won't need a 4WD system, and Premium spec is a nice half-way house between the more basic SE models and more luxurious Premium SE versions. The engine’s size is given in litres (here it’s 2.2) and the letters CRDi indicate that it’s a diesel. Buyers have the choice of a six-speed manual or eight-speed automatic transmission. UK versions of the Santa Fe are powered by the 2.2 CRDi diesel engine, producing 197 horsepower (hp), which can be combined with a six-speed manual gearbox or an all-new eight-speed automatic.. The engine is carried over from the last car, where it was smooth and powerful, so that there was no need to rev it hard while driving or towing. Fuel economy is expected to be similar to the outgoing model, which has an official rating of between 42.2mpg and 46.5mpg. However, drivers can only expect 35mpg with the automatic gearbox and 37mpg with the manual, according to the Equa Index which estimates fuel use based on public road testing. All cars also come with a newly developed four-wheel-drive system call HTRAC, which distributes the engine’s power depending on the driving mode selected. In sport mode, it’s configured for maximum acceleration; Comfort mode improves stability and Eco mode offers maximum efficiency. In slippery conditions, the system adapts to offer maximum grip. Hyundai doesn't give you much in the way of engine or trim choice, but it is well specced to beging with. SE models come with 7 seats, roof rails, front and rear parking sensors with a rear view camera, privacy glass, dual zone climate control, heated front seats, drivers’ seat height adjustment, leather steering wheel, automatic windscreen wipers, DAB radio with Apple CarPlay and Android Auto, cruise control, Lane Keep Assist, Autonomous Emergency Braking and Smart High Beam Assist. Upgrading to Premium offers more equipment, and allows you to pick the 4WD system too. It also gets 18” alloy wheels, keyless entry with engine start/stop button, LED headlamps, heated steering wheel, electric front seats, leather seat facings and an electrically operated tailgate. Also on offer is an 8” touch screen plus additional safety features that include Rear Occupancy Alert, which alerts the driver to any occupants that have accidentally been left in the vehicle when the central locking is operated. It also gets Blind Spot Detection on manual models and Blind Spot Detection with Brake Assist on automatic transmission models. Top-of-the-range Premium SE models get 19” alloy wheels, a panoramic sunroof, ventilated front seats with drivers’ seat position memory function, and a head up display which projects relevant information directly to the drivers line of sight. It also introduces an around view monitor (automatic transmissions only) and is also available with an optional £300 Burgundy Pack which includes two tone burgundy and black leather seat facings, dashboard trim and a black suede headlining. The current generation of Santa fe doesn’t sell in great enough volumes to be included in the Auto Express Driver Power survey, but the company’s smaller Tucson is placed 17th out of 75 cars in the most recent (2017) edition of the survey, which is a good sign. In addition, Hyundai is the 10th best manufacturer, which is another useful indication of reliability. The Santa Fe’s five-year, triple-care package covers warranty, RAC roadside assistance and annual vehicle healthcare checks – all of which makes it superior to all but the Kia Sorento (which has a seven-year warranty) in its class. This is Hyundai's fourth-generation Santa Fe. It's an SUV, which means it's big and rugged, and is known for its class-leading safety features and space. Hyundai's latest SUV features the company's most advanced four-wheel-drive system yet. It's designed to give the driver the most amount of grip and control in poor driving conditions such as snow or mud. This generation Santa Fe is the first to feature a head-up display, showing information such as speed, navigation commands and fuel level, in addition to alerts from active safety and driving assistance features. Flexible interiors that let you fold, or even move the seats, these are some of the most versatile vehicles on the road, offering the option of cavernous boot space, luxurious space for a few passengers.